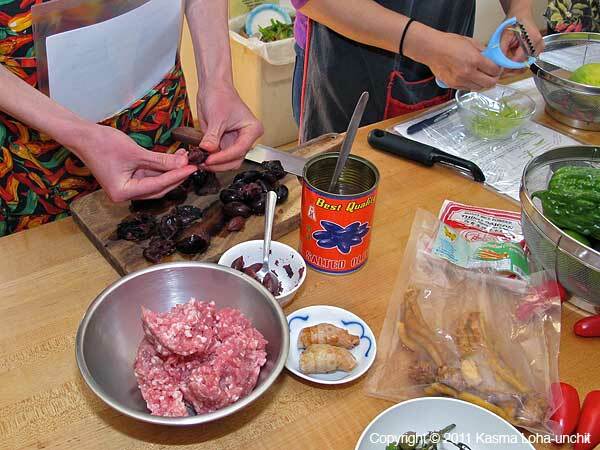 Be sure to read Kasma's article on Salted Black Olives. Heat the oil in a wok until it is hot, then reduce heat to medium and fry the cashews in the oil, stirring frequently, until they are an even rich brown color. Remove from oil and let cool in a wire mesh strainer. Remove half of the oil remaining in the wok, reserving it for later use. Add the dried shrimp and fry until the color has deepened and they are crispy. Drain from oil. Turn the heat up high and quickly stir-fry the fresh shrimp until they are cooked through. Remove from wok and set aside. Beat the eggs and make 2 to 3 thin egg crépes out of them in a flat round pan, using some of the reserved oil. When the crépes have cooled sufficiently, roll them up and slice very thinly into fine shreds. Peel the green mango and julienne into very thin strips about 1 to 1 1/2-inches long. Remove the pit from the salted olives and chop finely. Reheat the wok and add 3 tablespoons of the remaining reserved oil. Toss in the ground pork and garlic and stir-fry, breaking the pork into little bits as it cooks. When most of the pork has changed color, add the chopped salted olives and sugar. Stir-fry until the pork is cooked through. Loosen the grains of the leftover rice before tossing into the wok. Stir-fry for several minutes until the rice is well heated through and well mixed with the pork and olives. 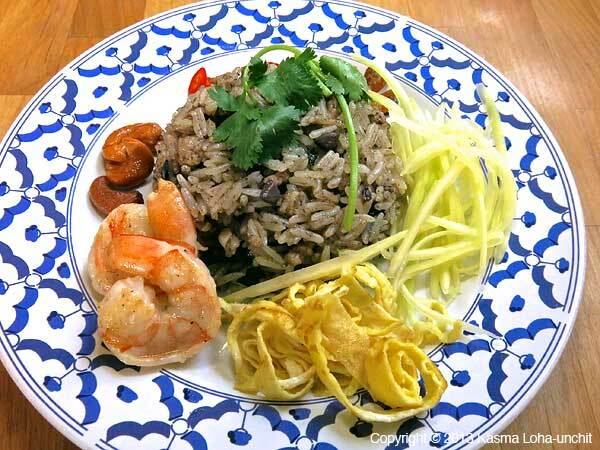 Dish the fried rice onto individual serving plates in a rounded mound in the center of each plate. – use a small round bowl to help make neat rounded mounds (i.e., fill the fried rice in the bowl and invert over center of plate). 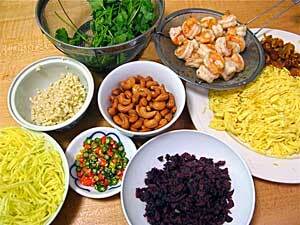 Arrange in small piles around the perimeter of the plate the cashews, dried shrimp, fresh shrimp, egg shreds, julienned green mango and Thai chillies. Top the rice mound with a cilantro sprig. Eat the fried rice with the accompanying tidbits. For those who like the rice spicy, toss the chilli rounds into the rice. Serves 6 to 7 as a one-dish meal. Kasma teaches this recipe in the Evening Series Advanced Set D-4. *Because the Thai language has its own script, there are different ways of transliterating Thai into English. 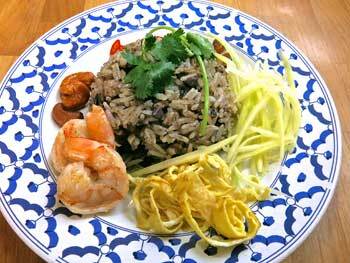 The more phonetic version is Kao Pad Nahm Liap; another spelling is Khao Pad Nam Liap. See A Note on Thai Pronunciation and Spelling.